As a London wedding photographer I love having the chance to shoot locally, particularly in Islington which is just down the road from me. 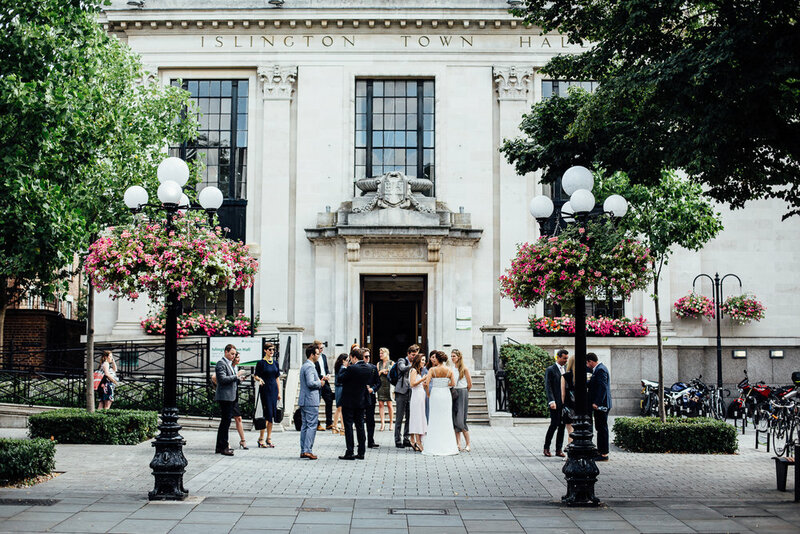 I've been lucky enough to visit the lovely team at Islington Town Hall a number of times, and am always delighted by how unique and intimate each day feels. There are four individual spaces for your ceremony at the venue, each one offering it's own charms, capacities and excellent opportunities for truly outstanding photographs. And there are many amazing pubs nearby that are perfect as an informal and contemporary wedding reception venue. For one of my favourite weddings at Islington see the full link for Greg and Nicole here. Here's a bit more information on the space. The Council Chamber - The largest and most impressive space, with beautiful high ceilings and stained glass windows. This room seats up to 100 guests, and is located at the top of a large sweeping staircase. Perfect for photo opportunities! The Council Chamber is £300 for Tuesday-Friday weddings, or £580 on Saturdays. For an additional £160 a further 60 guests can be seated in the balcony. The Mayor’s Parlour - A dinky space for ceremonies of up to 12 guests on cosy leather seats. £300 from Tuesday-Friday, or £580 on Saturdays. The Richmond Room - The latest addition to Islington Town Hall, for ceremonies of up to 60 people. Only available on Saturdays for £480. Room 99 - This is the most popular room at Islington Town Hall, and as such can be rather restrictive on ceremonial details due to quick turn around times. The newly refurbished space seats up to 28 guests, and is available for £54 on Mondays, £130 on Tuesday, Wednesday and Thursday, £210 on Friday and £260 on Saturday. Get in touch with the fantastic team at Islington Say I do for more information.